In January 2010 I saw 500 pounds of beeswax for sale on eBay. The seller was a Michigan beekeeper with a fairly large honey operation near Traverse City. I purchased the wax at $3 a pound. I avoided delivery charges by picking up the wax. It was a one-day, 600-mile round-trip. My two dogs went with me. The wax fit neatly in the back of the pick-up truck. This was my first large purchase of wax. Over the next few years I made seven more purchases from that Michigan beekeeper, each purchase being from 200 to 500 pounds. I’ve also bought wax from a beekeeper in Iowa, each purchase again being 200 to 500 pounds, and there was one pick-up of 249 pounds of wax from a beekeeper in Wisconsin. Overall, over the past nine years, I have bought 5,705 pounds of beeswax, sometimes picking it up, other times having it delivered. From my first beeswax purchase to my most recent purchase last week, the price has increased 76 percent. The largest single increase occurred between February and October of 2012, when the price rose by 50 percent, and that is what brought about that one trip to Wisconsin. The price I paid for the Wisconsin wax was a dollar per pound less than what my Michigan supplier was charging. But the quality of the wax was different. I was used to the Michigan wax and figured my customers were, too, so I went back to it. About this time I began having the wax delivered, as I had moved and the journey to Traverse City was 800 or so miles round-trip, entailing an overnight stay, which I did once, stayed overnight, in a motel with my then very old dog Buster, and that was a nightmare, so all in all delivery seemed more efficient. In the spring of 2015, a second large price increase occurred, again about a 50 percent jump in a half-year’s time, and so again I looked for another supplier and found wax for sale in Iowa at a price that was just a 10 percent increase from what I had been paying. I purchased 199 pounds and arranged to pick it up on my way home to Michigan from California, where I had spent the winter. The pick-up was to be in April, a busy time for the beekeeper and I was traveling with an excitable dog and an unhappy cat in a fully loaded van, but all went well, and I was glad I was able to pick up the wax at the farm. Since then, all the wax I have used has come from this beekeeper in Iowa, with subsequent purchases arriving by delivery truck. This January he offered wax at two prices based on the quality of the wax. Quality is somewhat subjective, but the higher priced wax was, for one, deemed “cleaner.” I went for it as over the years I have learned that the cleaning process the wax goes through before I receive it makes a difference, as the cleaner the wax I buy, the less cleaning of wax I have to do. (Starting with completely clean wax is, for me, cost prohibitive. And beeswax, before being used for most any purpose, must be cleaned of hive debris and honey, which can be accomplished in various ways, all ways using some combination of heat, water, and gravity, which I also use, melting chunks of wax in a crock pot with an inch or so of water in the bottom, then straining the melted wax through cloth to remove any remaining minute particles of debris and, as well, the occasional recalcitrant bee, stray wing.) The cleaner, higher quality wax being offered was just seven percent higher in cost from 2015, and 10 cents more per pound compared to last year’s purchase. The wax I purchased last year, and now this year, was cleaned, I am told, in a “coffin melter,” and this is what makes the difference. I admit to liking the name, which relates, as I understand it, strictly to the melter’s shape. Each lot of wax I buy dwindles down slowly over several month’s time. When the time comes to buy more, worrying questions arise. Will wax be available? At what cost? How much should I order? What will the delivery charge be? Will delivery go smoothly? Answers arrive swiftly at first, then more slowly—it all tends to play out over a week or two. Delivery charges can be a wild card, and I always mull the possibility of taking that road trip to pick up the wax, but, instead, I get the price of delivery, process it, and recall the time I picked up 500 pounds of beeswax in the van, and how I had to drive several hundred miles with the windows open, despite the weather, as there can be, indeed, too much of a good thing. Yesterday, 500 pounds of beeswax arrived. The truck driver gave me a call about an hour out just to make sure he could get the semi down my street and get the wax unloaded without a lift gate, which I had said we wouldn’t need because in the past it never had been needed and a lift gate adds to cost. 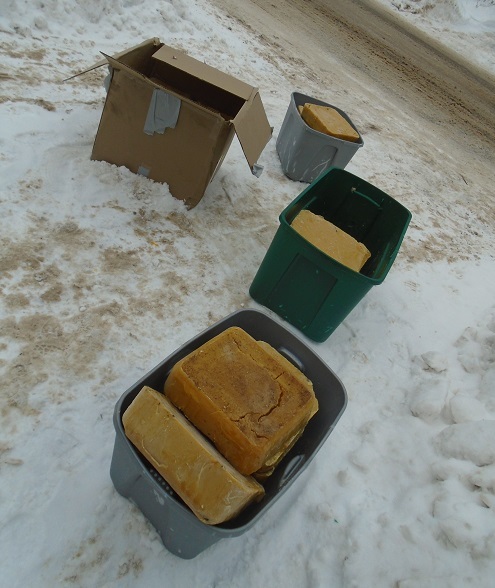 The truck driver moved the boxes of wax which were strapped to a pallet from the front end of the long long trailer to the back, slit open the boxes, and together we unloaded the wax blocks, about 15 pounds each, into some plastic bins I had ready at the end of the drive. About halfway through the second box I suggested we just let the box drop to the snowy ground, and that worked. The wax was unloaded. There was a fine drizzle, or mist, in the air. The truck driver told me about his beekeeping, just a hive or two (and its hard to keep those bees alive over winter), and how he and his wife also keep goats, a milk cow, not too far south of here. The wax sat at the end of the drive for a bit, then a lucky friend who had just happened to stop by helped me move it to the shed. 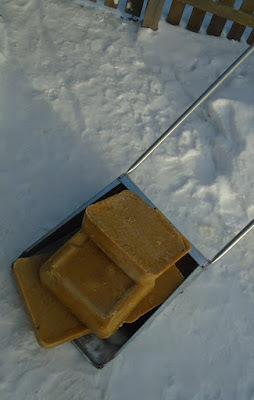 Turns out two old ladies can do this pretty easily, can move 500 pounds of beeswax down a snowy drive, especially if they have a “yooper scooper,” an item more commonly used to shovel, or push around, snow.